Synopsis: In Fun and Games, Balchin applied the formula he had used to debunk business in How to Run a Bassoon Factory and Business for Pleasure in an attempt to demystify the world of sport. In twenty-four chapters he describes how to succeed at a wide range of sports and pastimes, from archery to cricket, baseball to all-in wrestling, fishing to yachting. Context: Balchin was an avid sportsman in his youth, excelling at a great many games at Dauntsey’s School (and to a lesser extent at Peterhouse). Although distinctly more sedentary in later life, he continued to play occasional games of cricket and rounds of golf well into his forties, as well as snooker at the Savile Club! 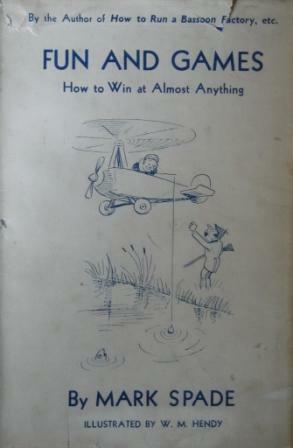 The book was again written under the pseudonym Mark Spade and its original title was The Sportsman’s Vade Mecum. Verdict: This is an amusing squib, no more, no less. It is written in very much the same style as How to Run a Bassoon Factory and Business for Pleasure and the light, flippant whimsy deployed will not be to everyone’s taste. Balchin relies largely on humorous misunderstanding to obtain his effects, for example by suggesting that water polo is played on horseback, and this technique wears a little thin by the end of the book. Availability: Almost impossible to find these days.